This province's territory is low hilly and predominantly steppe. People call that is is land of extinct volcanoes and man statues. Since 1760 the land was used as exiling area for Mongols, who had nation pride and power of resistance against Manju dictature. Therefore, the land is called of good man's and good horses, which are super at their speed. 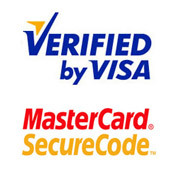 The average altitude is 1000-1200 m above sea level. The highest mountains are Shiliin Bogd (1777 m) and Munkh Khan (1600m). Lakes of Ganga nuur, Duut, Dosh are popular destinations. There are 220 dead volcanos, such as Shiliin Bogda, Zotolkhan, Altan ovoo, Ayabadar, Asgat, Senjitiin Undur, Dosh, Ganga, Tsagaan ovoo and Nart. The highest one is Shiliin Bogd Uul, 1778m above see level. Shiliin Bogd Mountain can be seen for a distance of 60 kilometers from all four sides. The crater of the volcano is about 2 kilometers wide and 300 meters deep. This extinct volcano is sacred to all Mongols, specailly for men. Only man allowed to reach on the top, specially men climb there at the sunrise. Shiliin Bogd Mountain offers the greatest view of sunrises. There is a new statue of Toroi Bandi, the 'Robin Hood' of Mongolia, who expressed his resistence against Manjurian rulers as stealing horses from them and then delivering them to poor mongolian families. The statue was erected in 1999. 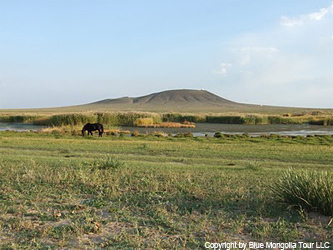 The skyline of this steppe area is distinguished by Altan Ovoo, a wide former crater topped by a new stupa, which only men are allowed to visit. The stupa was built in 1990 on top of the ruins of old Battsaagan stupa, which was built in 1820 and destroyed in 1937.There are dozens of broken balbal - their exact origins are not clear. There are also three main balbals known as the king, the queen and the prince, nearby it there are some hay sheds. According to local tradition, you should offer some food in the cup on the statue's left hand. Ganga Lake Nature Reserve is reserved in 1996 as to protect the flora and fauna of this sacred land and unique heritage of silversmiths. It covers 28000 hectare area and 6 lakes. The three main lakes, Kholboo Nuur, Tsagaan Nuur and Ganga Nuur, are good for birdwatching and outdoor tent camping. By the end of August and the beginning of October, the lake is home to thousands of migrating swans, and it is exact time for bird photographing. Just at the border of Mongolia and China the long range of basalt rocks covering of dead volcanoes stretches as far as 3,861 square miles (10000 sq.km). By 1780-1880 local people built several small buddhist temples around this volcanic hills, therefore, this is called by local people as Sumtei Budriin Chuluu - Lava Rocks with temples. Local people consider that there are 222 extinct volcanoes in this area and volcanic upland has a 30 meter thick cover of basalt lava. They erupted lava during the Quaternary, a short time ago in geological terms. Just in 15 minutes drive from Shiliin Bogd mountain, you can reach one of the Mongolian largest caves. It is interesting formation of caves as it was formed in steppe area, not in mountains. This large sized and a little claustrophobic cave has seven chambers to explore. If the ice covering the entrance has melted (it's normally covered until August) you can squeeze through the narrow entrance. There are more than 200 man statues in this province and this big numbers of statues attract historics and scholars a lot. An ancient tomb, Burkhant, is located in the Ar Jiremiin Gobi area. 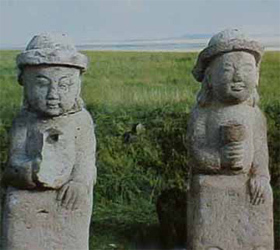 The development of sculpture of imperial Mongol times has to be judged by the few but highly expressive samples of stone men, stele and decorative architectural elements. The stone figures in are distinguished by their headdresses, clothes, ornaments, postures and seats. Khurgiin Khundii Valley is in distance of 40km West of Shiliin Bogd Mountain. Here a dozen or so ancient (pre-Chinggis Khaan) stone statues lay on the ground. The origins of these statues are debated. But scholars consider that it is representing famous people from the region and dated to Turkish period 6-8A.D. But local people has story about it as these statues were built to commemorate local women who jumped off a nearby mountain because they were forced to marry men they didn't love. Near this statue there is a small beautiful place for camping is Bichigtiin Shahaa canyon. There are 4 man stones named as Nobleman, Queen, Son and Bride in Dariganga village area. They were proved to be memorials belong to a same period because of their appearance, clothing and decorations. But, stones used to make them vary. The man stone, known as Bride stone among public, was proved to be a representation of a man as a result of a study by D.Tseveendorj, a director of Archeological Institute in Scientific Academy. According to his explanation it was named Bride, because of the locals’ willingness to bring it close to their life. Deels /outer gown/ of dressed man stones, which belong to Mongolians-ruling period, have a breast on the right side, while that of Turkic period have a breast on left side. One of many myths related to these man stones is following: Once upon a time, there lived a nobleman with his subjects and relatives in this land. Once he went for hunting with his subjects and let flock of gazelles fall down the steep rock. As a result, they were punished severely by the heaven and his lineage was washed away. So, after that his family was buried with their belongings in this land and man stones for them were built. And it is supposed that the inscription on the Bichigt rock warned descendents not to repeat their action. On the other hand, researchers claim these man stones are memorials for sacrificing golden lineage of Chinggis khan. Lkhachinvandad Uul Natural Reserve is located on the border with China, so before traveling there, it is better to have issued with entrance permission from Mongolian Border Checking Authority in Ulaanbaatar. It covers 58000 hectares area around Lhachinvandad Mountain (1233m) and its surrounding area to protect the species of gazelles, mountain deers and elks. It is amasing to see running deers app.200 deers on granite rock mountains, low open green hills and then to boundless steppe. There is also a chance to see eurasian badger and raccoon dog. Dariganga Musuem is in Baruun Urt town and it has a reasonable collection of costumes representing the three ethnic groups that inhabit the region: the majority Khaikh, Dariganga and Uzemchin. 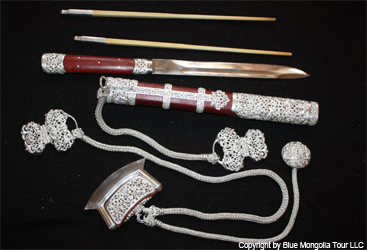 This province is very famous for its unique heritage of applied arts made of metals: fancy carved silver cups, gold molded unrepeatably decorated knife and many more staffs made by Dariganga's silversmiths and blacksmiths. Horse culture is used to define a tribal group, whose daily life revolves around the herding, breeding, using of horses in many sides. In Mongolia the racing fast horses are from Sukhbaatar province and dariganga area and this place is rich with traditional habits concerning to Mongolian horses. Nomadic life based on horses made this horse culture and this knowledge and traditions are very well kept by esstern mongols still today. 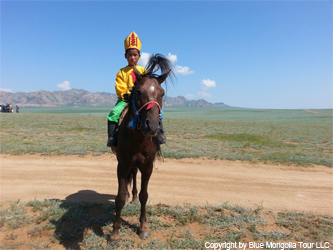 Even in Mongolia nomads' children learn to ride as soon as they can walk. 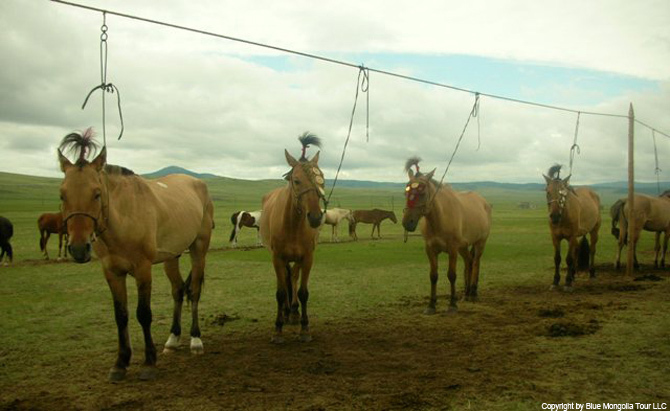 Now, Mongolia is possibly the most equestrian nation in the world. During the horseracing at Naadam Festival thousands of horses are gathered for racing. The race distance ranges from 15km-30k. Jockeys are between 5 and 12 year old boys and girls. There are 6 categories of races depending on the horse's age; from 1year old (Daaga) to 5year old horse (Ih Nas). Almost 500 horses race at one time and their kid jockeys sing a special songs for their horses for racing well. There is only nation, that sing a songs for horses, is Mongolia. 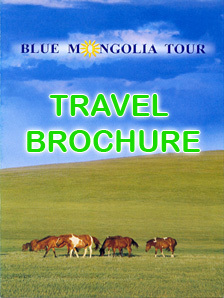 Mongolian language is imbued with the horse culture. Mongolians don’t give names to their horses. They consider it enough to distinguish them by their colour. There are around 300 names of colour which are used just for horse identification. Their vocabulary is so precise in terms for nuances of a horse’s coat that despite the number of horses in vicinity, there is never confusion about which horse is being discussed. Nomadic mongols invented many kind of musical instruments, one of them is horse-head fiddle, known as the Morin khuur. It has two strings, made from horse tail hair, with the distinctive and decorative carving of a horse head on top. The sound of morin khuur is like horse and it often accompanies the unique long songs which regale the beauty of the countryside and relive tales of nomadism.